This week I've been featuring the Tin Tile Dynamic Textured Embossing Folder. Today I have a Christmas card using a border layer that I embossed with this folder. This was pretty easy to make and I love the colors, Cherry Cobbler and Mossy Meadow. It really has a country feel to it. The sentiment is from the Timeless Tidings Stamp Set. 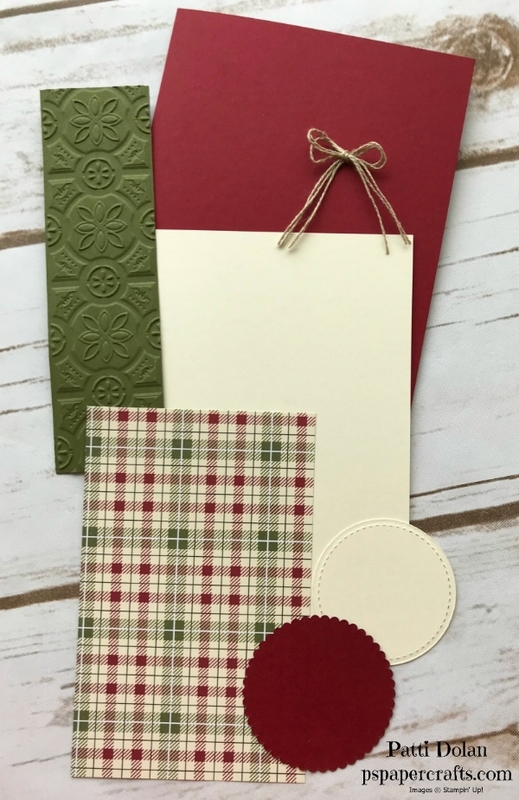 This Festive Farmhouse Designer Series Paper has so many nice country patterns. I just love plaid for the holidays. Emboss the strip of Mossy Meadow and then trim as needed. I usually start with a piece a little longer than needed because it shrinks a little when you emboss it. Trim it after you emboss it. I adhered the layers down with Liquid Multi-Purpose Glue and then the sentiment was popped up with Dimensionals. I cut 3 strands of Linen Thread and tied a small bow and then attached with a glue dot. Newer PostProduct of the Week - Timeless Tidings Project Kit!!! Older PostGetting Ready for Autumn!